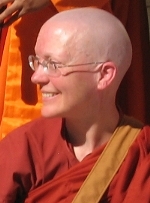 Ayya Santussika was a computer engineer and mother of two before becoming a Theravada Buddhist nun. She began teaching meditation in 1999 and entered monastic life in 2005, training primarily in the Ajahn Chah tradition. She resides at Karuna Buddhist Vihara in Mountain View, CA.